Haiz... Make sure I get ready the phone before taking out soufflé. Preparation:- prepare 3 ramekins, greased and dusted with castor sugar, set aside. Check the consistency, it should be like thick cream, extent the cooking time if it is still waterly. Add sugar 1/2 tbsp by 1/2 tbsp after 1st minute. 5) Mix 1/3 meringue into white sauce, mix until homogeneous, mix the balance into batter gently fold in and mix well. 6) Fold batter into ramekin, full cup, tap the cup on table to get rid of large bubbles, continue to fill the ramekin full, run thumb around inside of the rim. 7) Bake at 200℃ for 18 - 20 minutes. 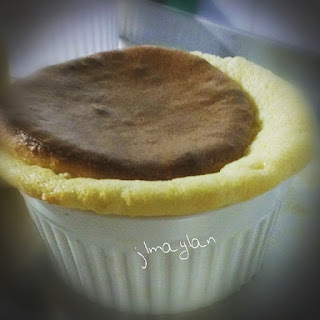 Soufflé doesn't wait for man, man has to wait for Soufflé, make sure you are ready before Soufflé is taken out.
. *`;`* Archive *`;`* .
. *';'* Friends' Online shops *';'* .
. *`;`* 情牵坤成 *`;`* .